This site is best viewed with a serif font (personally, I like Georgia or Bookman, and one of these days I'm going to figure out how to make sure that's what you see!). (Last update: 06Mar2006) The Un-Blog™: Where I provide the newest info with the least prep time… This page is mostly a way for me to get the word out on changes and/or fixes to my amps – along the lines of a "Corrections" page – but I'm reserving the right to comment on any electrical or musical idea that crosses my mind. Yes, that's a PC power supply module that's been turned into an amp. 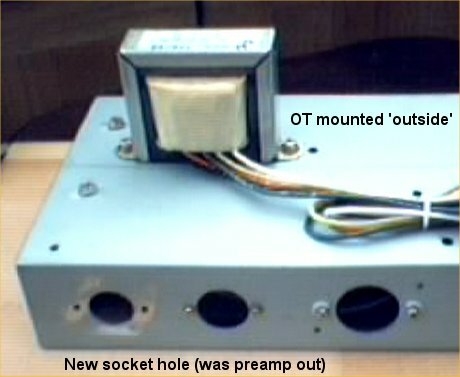 The two 6021 subminiature tubes and the trannies are inside, and the mini-subwoofer fits exactly where the fan used to be. I was hoping to get a half-decent practice amp out of it, but it falls a little short with this speaker (I guess I'll be doing some shopping!). On the other hand, it sounds great when played through bigger speakers. The Verberator is my most ambitious project to date. It's a push-pull EL84 combo with reverb and two different input tubes: an EF86 and a 12AY7/6072A (with the two triodes in parallel). I did everything I could from scratch, including fabricating the steel chassis from sheet metal. The Verberator is definitely my best amp yet. The Decimator is a very low power amp (about 3W) using a self-split 12BH7 for the power stage, inspired by the work of Adam Alpern and Doug Hammond . I liked what they'd done, but wanted a little more control over the distortion and tone, so I added a preamp stage, gain control and Baxandall tone stack. 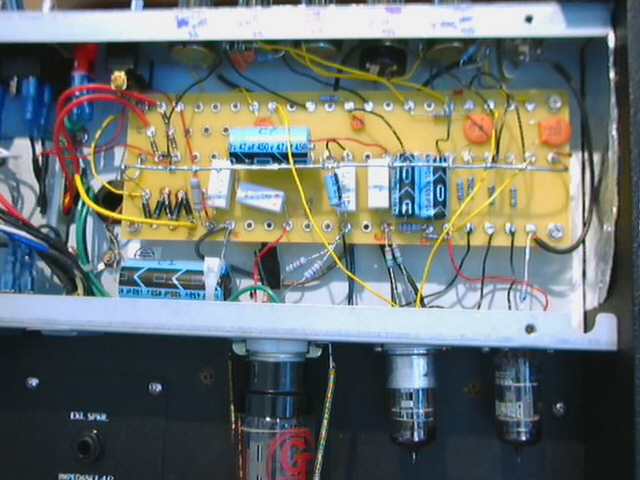 The Decimator preamp was also prototyped as a module hooked up to the Tonerator. 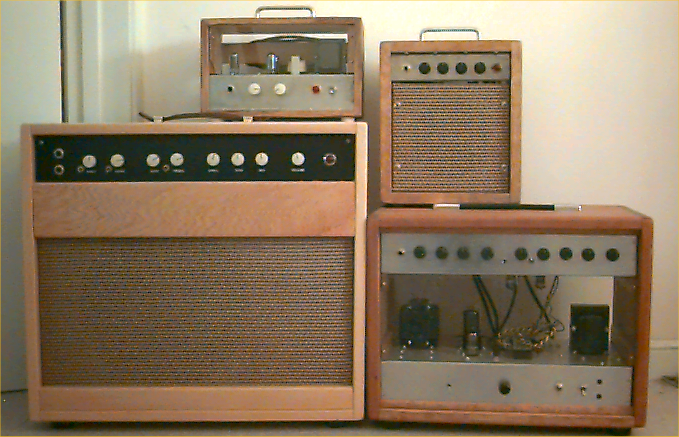 The Tonerator I is my first home-brew, a 6V6 push-pull amp based on the projects in Kevin O'Connor's "Tonnes Of Tone." The main objective of the Tonerator was to create a platform for use in future experiments with preamp topologies, so the preamp is mounted in a separate chassis from the power supply and power amp. Tonerator sample recording: E Train ( Copyright © 1979 Mark Lavelle ) (2:28). This recording is me and my '73 Tele with Barden pickups through a Peavey Valverb and the Tonerator (1st guitar) and my brother on a 335 through his Hot Rod Deluxe. An amusing little diversion: three pentodes, two knobs and about one watt. It even has custom knobs to go with the "pento" theme (check out the pictures page). Definitely playable, but ripe for some tweaking to get the most out of it. The Electron is a single-ended 6L6 amp built into the cabinet & chassis of an Electar Tube 10 amp. This was my first creation with a Baxandall tone stack (a feature on my Ampeg Gemini I that I've always liked), and an experiment with having two gain controls. The experiment failed, in the sense that having gain control at two stages doesn't seem to buy you much in the way of tone variation (at least the way I built it!). The Electar is sold by MusicYo! . The Line 6 Floor Board Exposé! You might never guess it from the rest of this site, but I also own a Line 6 POD and Floor Board. They've both been gathering quite a bit of dust since I got bit by the vacuum bug, but my ideas for the Murgatroid & Verberator II got me thinking that I might save myself some work/money – and open up a lot of options – by using the Floor Board as the pedal box for these projects. In that spirit of laziness saving myself work, I figured I'd just ask Line 6 for a copy of the Floor Board interface spec. I made it quite clear that I was only interested in it for my own personal use (even offered to sign a non-disclosure agreement!) and wouldn't need or want any other support, but they blew me off with the expected "that's proprietary!" reply. I happen to make my living as a firmware engineer, pretty much specializing in the interfaces between computers and their peripherals, so I was prepared all along to figure it out myself. The bulk of the figuring was done in one evening, and now I've written up as much as I could figure out about it, so that anyone who's interested should be able to use it for their own devilish purposes. The goal with this one is a low-power (10W) studio/practice amp that can switch between relatively clean with reverb and high-gain without reverb. The current concept is to build in something like a Fender 6G15 Reverb for the front end, but the "wet" side of the circuit will either drive the reverb tank or be used like a chained single-ended amp in front of the rest of the preamp (it's all still a bit nebulous!). The only definite part is that the power amp will be a push-pull pair of 6BM8s with their triodes wired as a long-tail pair PI (like a lower-power version of the Verberator). All content on this site is Copyright © 2001-2006 Mark Lavelle. All rights reserved.